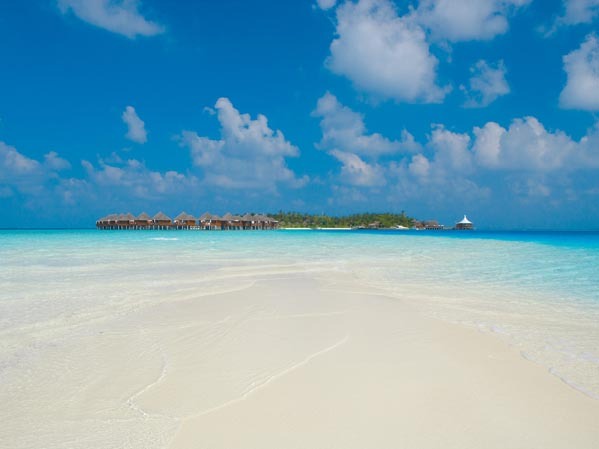 Baros is a very special island, in a quiet sort of way. Arrivals are greeted with a glass of champagne in the welcome pavilion engulfed by tall, slender palm trees. 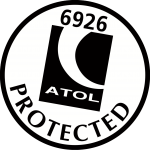 Accommodation is of a high, classic standard, whilst retaining an element of natural style. Dining is pure delight in magical settings. 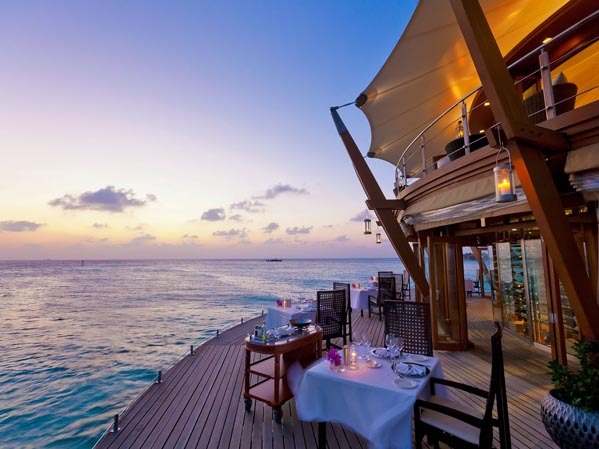 Few things in life rival sunset cocktails and canapés on the elevated Lighthouse terrace followed by alfresco dinner featuring lobster bisque prepared at the table, whilst you marvel at the passing reef sharks. 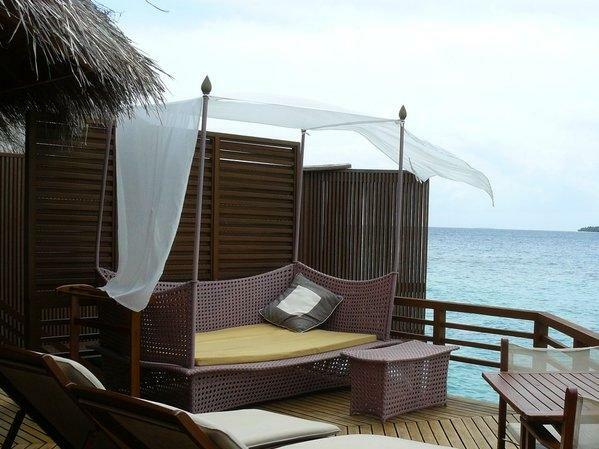 Baros is a place for couples to relax, enjoy some of life’s luxuries and explore the marine life on the fabulous house reef. 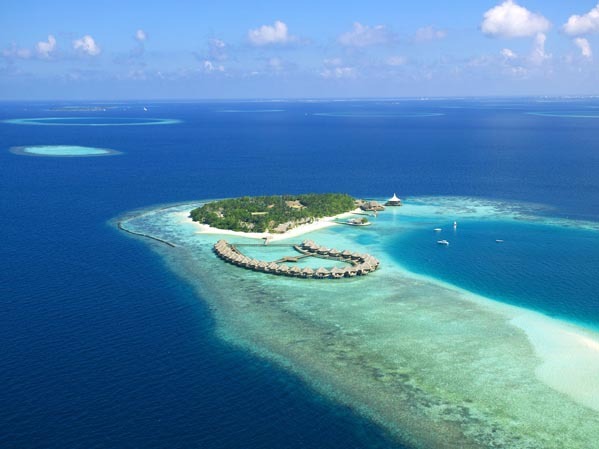 Located in North Male Atoll, Baros is very convenient for those wishing to maximise their time in resort as it is a mere 25 minutes by luxury speedboat from the airport. It is a small, quiet resort appealing mainly to Honeymooners and discerning couples – children under eight are not permitted on the island. There are good beaches around most of the island apart from the areas around where the restaurants have been sensibly located. 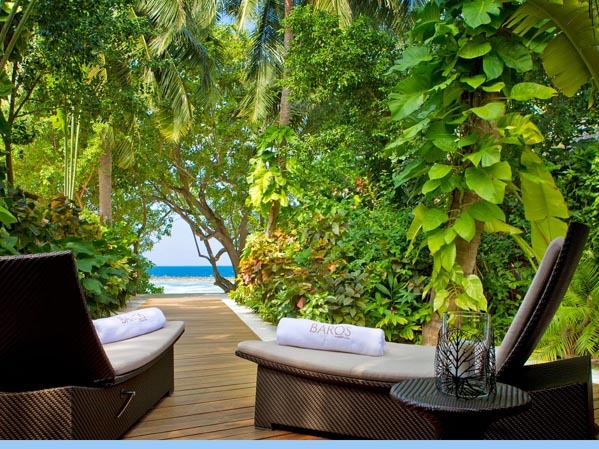 The island interior is particularly beautiful with a huge variety of tropical plants in a landscaped setting. 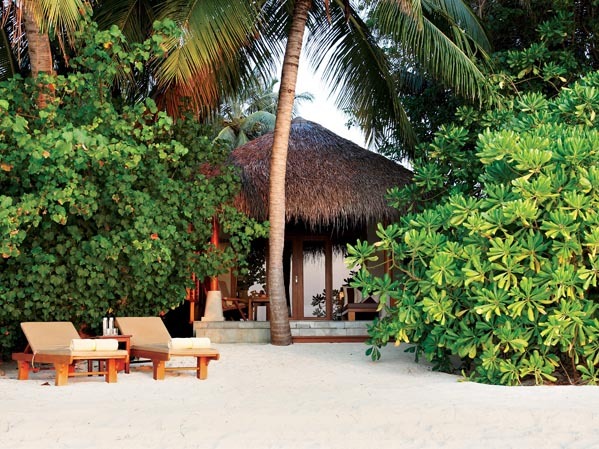 A sandy path winds through the foliage around the perimeter of the island and provides access to all of the beach villas. It takes around 10 minutes to walk around the whole island which measures approximately 350 metres x 380 metres. 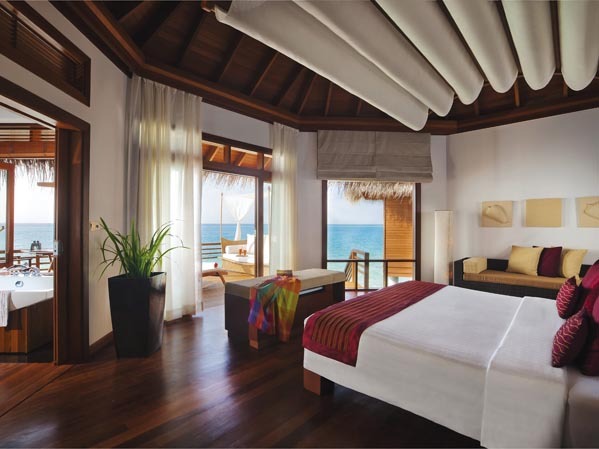 There are a total of 75 villas on Baros, 45 island villas nestled amongst the foliage and 30 water villas extending over the turquoise lagoon via a wooden jetty. All share the same style of natural sandstone, wood and palm thatch on the outside combined with stylish luxurious interiors. The emphasis is on simple style, quality furnishings and an impressive array of amenities including a private wine chiller. 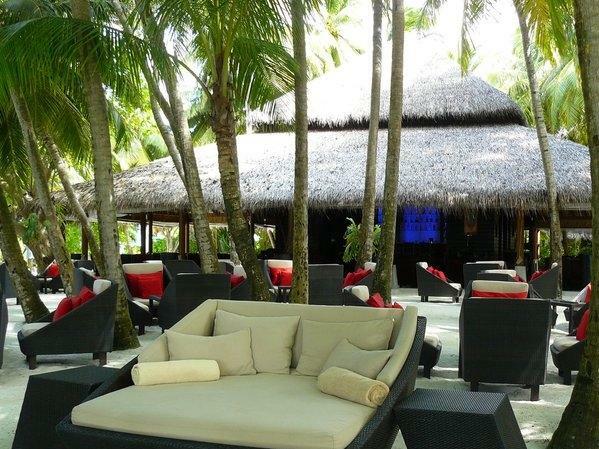 Plenty of options for relaxing are provided including an outdoor day bed, sun loungers and dining area. Some villas come with the added luxury of a private pool. 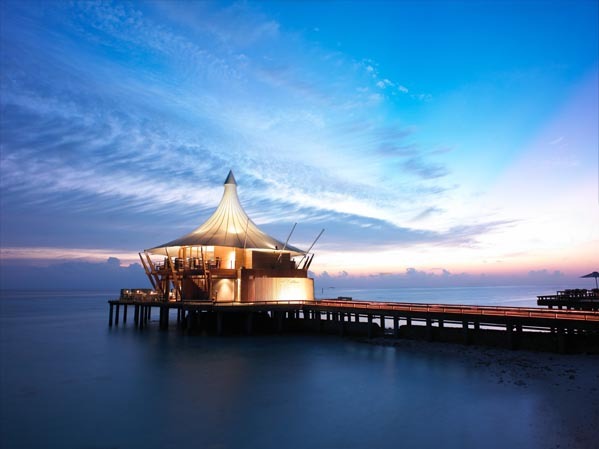 Where Baros really shines is in its dining and bar experiences. 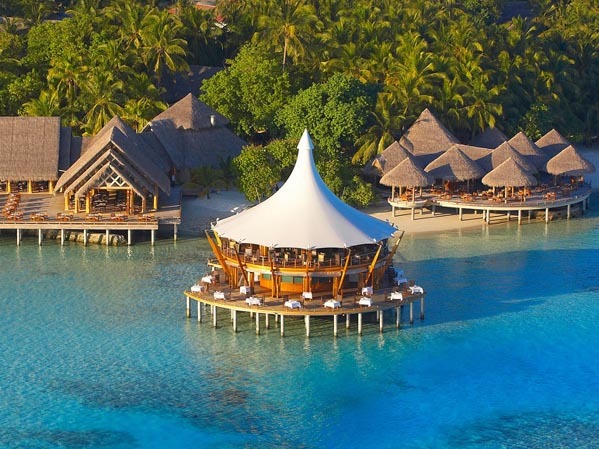 The Lighthouse Lounge & Restaurant is the iconic Baros signature – its white ‘big top’ style roof is visible and instantly recognisable across the atoll. Come to the first floor open sided Lighthouse lounge for pre-dinner Martinis as the sun dips over the island and you have the true essence of Baros. 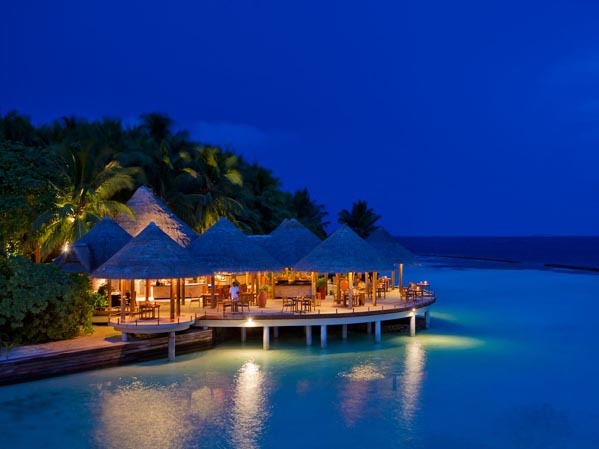 Three restaurant areas provide a stunning choice of cuisine from local Maldivian specialities to Japanese Teppanyaki. Breakfast on the sun drenched deck of Lime restaurant is a delight and includes a glass of champagne for that extra special touch. Such attention to detail makes this resort a firm favourite in our opinion. 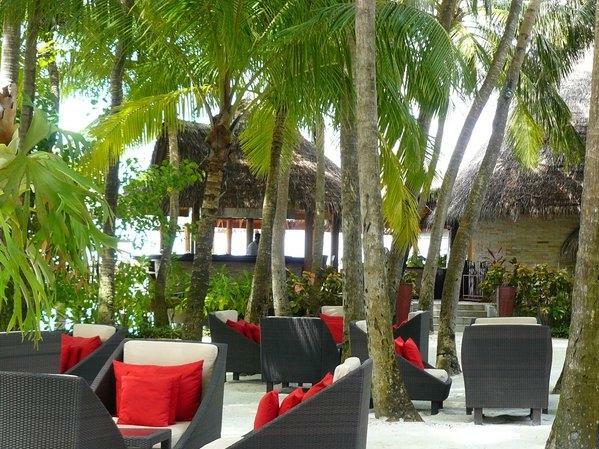 Sails Bar is a sophisticated, modern bar with open sides flowing into the beautiful palm gardens adorned with stylish day beds for relaxing. Local bands provide low key evening entertainment in this magical setting. Other facilities include a Spa, Gym, Watersports and Marine Centre with resident Marine Biologist. A resident nurse is available on the island together with an on-call doctor service. Snorkeling at Baros is very rewarding. The house reef encircles the island hugging the shore line around half the island and then extending into the ocean beyond the lagoon on the other half. 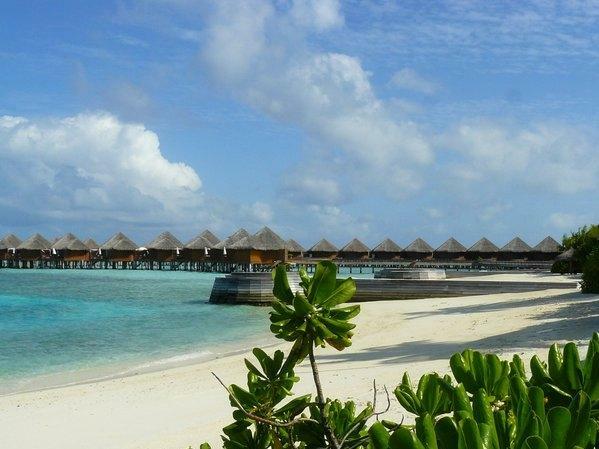 The water sports, diving and marine centre are sensibly located where the reef is too far to reach from the beach. The reef itself is excellent. Corals are extensive and in good condition. Marine life is abundant and rewarding – we were quickly joined by a turtle, moray eel, and some impressive sharks. Divers Baros Maldives operate a comprehensive programme of PADI courses and two daily boat dives to around 30 dive sites to suit all levels. A personalised dive programme, ‘Diving by Design’ is also offered to guests who prefer an individual schedule. Other activities on offer include a range of water sports, air conditioned table tennis and a gym. A programme of excursions including big game fishing and dolphin cruises are bookable locally.